Rinse beans and be careful to remove pebbles. 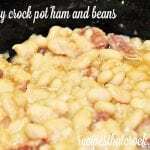 Place in crockpot and add remaining ingredients. Cover in water until water reaches about 2 inches above the beans. Cook on high for 2 hours and then on low for 4. Remove meat from bones and discard bones. Stir and crush some of the beans to make the dish creamier.